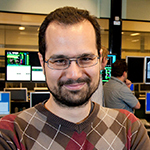 Maximos Tsalas is a research fellow at DIFFER – the Dutch Institute for Fundamental Energy Research, and a Session Leader at the Plasma Operations Group of the Joint European Torus (JET), the largest experimental fusion devise currently in operation. He has previously worked in a number of European magnetic confinement experiments, including ASDEX Upgrade and TEXTOR in Germany. His main expertise is on plasma operations and plasma diagnostics in magnetic confinement experiments. He has worked in the design and development of a number of such systems, including magnetic probes, Thomson scattering systems, Zeeman spectroscopy and Langmuir probes. This introductory talk will give an overview of the basic concepts behind magnetic confinement fusion research. We will start with a summary of the most useful fusion reactions, the conditions under which they can occur, and how energy can be obtained from them. We will then go on to describe what a plasma is, and how its magnetic properties can be used to confine matter in such a way as to make sustained fusion reactions possible. We will then review how current magnetic confinement fusion experiments work, focusing mainly on the most promising design, the “tokamak”. Finally, the main scientific and technological challenges presently facing fusion research will be presented and discussed.